Post-Democracy is an intelligent small book written for those who still care about perspectives of political egalitarianism – and it explains why egalitarian society is not any more on the agenda of post-democracy. Crouch’s main contention is that while modern democracies are keeping up the facade of formal democratic principles, “politics and government are increasingly slipping back into the control of privileged elites in the manner characteristic of pre-democratic times” (p. 6). Since the big wave of deregulation in the 1990s the socially and politically extremely narrow shareholder value paradigm has discriminated all intellectual efforts in search of a wider stakeholder economy. Crouch states that the neo-liberal effort to withdraw the state from providing for the lives of ordinary people and to focus on freedom of the markets was always accompanied by a growing colonisation of the same state by corporate interests. General elections in western democracies have degenerated to tax cutting auctions. Now, egalitarianism is not really my cup of tea and some of the critical observations about liberalism are not quite new. But I was intimidated by Crouch’s analysis of the “growing incapacity of modern citizens to work out what their interests are” (p. 28) and the big picture of post-democracy in which he put it. “The consumer has triumphed over the citizen” (p. 49) and citizenship is what he cares most about. The author lived in Italy under Berlusconi and this has probably given him a very concentrated insight into the orchestrated attempt to expropriate individuals of their capacity to form political judgements. From the German and Japanese side I can personally witness the same exhaustion of political intelligence, also the shift to more formal concepts and practices of democracy. 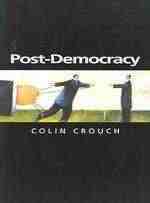 This is why I think that Crouch’s statement is right: post-democracy has already begun. i discovered colin crouch in the spiegel article, your post is very interesting. will definitely look for the book. in italy it is already neo-tribalism, in my view. What does “Since the big wave of deregulation in the 1990s the socially and politically extremely narrow shareholder value paradigm has discriminated all intellectual efforts in search of a wider stakeholder economy.” mean? Has the spell checker inserted “discriminated” in place of some other word. It seems to say a wave (of deregulation) has done something in order to search for something.